KRISTOPHER RIVERA | Mar. 21, 2014 | UNIVERSITY COMMUNICATIONS. David Hasselhoff's sidekick, K.I.T.T, a talking car from the television series Knight Rider, is possible today thanks to 21st century technological development. IBM created The Great Mind Challenge (TGMC) competition to prepare students for the technological needs of tomorrow. "(IBM) organizes this competition as a way to get people interested in the type of research that they need, especially in the area of machine learning," said Olac Fuentes, Ph.D., associate professor of computer science at The University of Texas at El Paso. "Machine learning consists of enabling computers to improve in the performance of a task by means of experience." This spring, the Watson Technical Edition of TGMC asked participants to develop an algorithm to help better sort data and inquiries, much like how K.I.T.T. could communicate as naturally as a human with Hasselhoff. UTEP's MinersVLL@UTEP team took second place in the competition out of 62 teams from around the country. UTEP participants included Fuentes; computer science graduate students Diego Aguirre, Abdul Kader and Jonathan Quijas; and senior computer science majors Alexander Knaust and Manuel Dosal. The name of the competition stems from Watson, a computer program developed by IBM that defeated two of the most successful contestants on the television game show Jeopardy in 2011. Watson uses a natural language user interface to answer questions in real time with great accuracy. This machine-learning technology is similar to Apple's application, Siri. Watson's program is not only for trivia and game shows. IBM started to extend this technology into the medical field. Doctors can provide a patient's symptoms and medical history to Watson, and its computer program will analyze medical books, articles and journals related to the situation. Watson then provides a diagnosis and recommends a course of treatment based on the evidence it has gathered. The program has access to the broad range of data available through the Internet. The computer system is able to rapidly understand and analyze natural language, including puns, riddles and complex questions across a broad range of knowledge. "What happens when you use Google? It will give you a bunch of answers," Fuentes said. "Suppose instead of giving you 10 answers it gave you 10,000. You're very likely to have exactly what you want there somewhere but you don't have the time to look at all of them. So what we want is something that classifies those potential answers." There are, however, numerous challenges for a computer program like Watson. The program has to understand the words spoken, the context, the meaning of those words and the semantics. Once it analyzes everything, it has to retrieve answers for the questions. The program comes up with a list of candidate answers, but most are not the true answer. 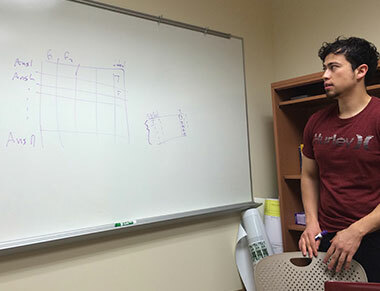 "This is the part where we come in," said Aguirre, a doctoral student and VLL team member. VLL stands for Vision and Learning Laboratory. "They generate a list of candidate answers for some questions and we have to say which of those answers are correct." The VLL team was given a data set, which is a large quantity of information gathered from the Internet. The team received no details about what the information represented. For a month, students worked to decipher the information and find the answers to the questions posted in the form of numbers. From there, the VLL team developed a machine-learning algorithm to select the correct answers to the questions posed in the data set. It was an intense process of research and trials. Four teams from UTEP participated among a competitive field of 62 universities from several states, including Texas, Arizona and Florida. The VLL team was in the lead halfway through the competition. After four weeks, the team ended in second place. The other three UTEP teams finished in the top 20. Although the students in the VLL team were disappointed about losing the lead, Aguirre said they were happy about the outcome of their capabilities. "The fact that we ended up in second place shows that UTEP has a lot of potential," Aguirre said. "It has the capabilities, it has the resources, the people, the students and the professors to be competitive."